Many congratulations to Huijuan Feng for completing her PhD’s study and being awarded the dual PhD degree by Tianjin University and University of Clermont Auvergne. 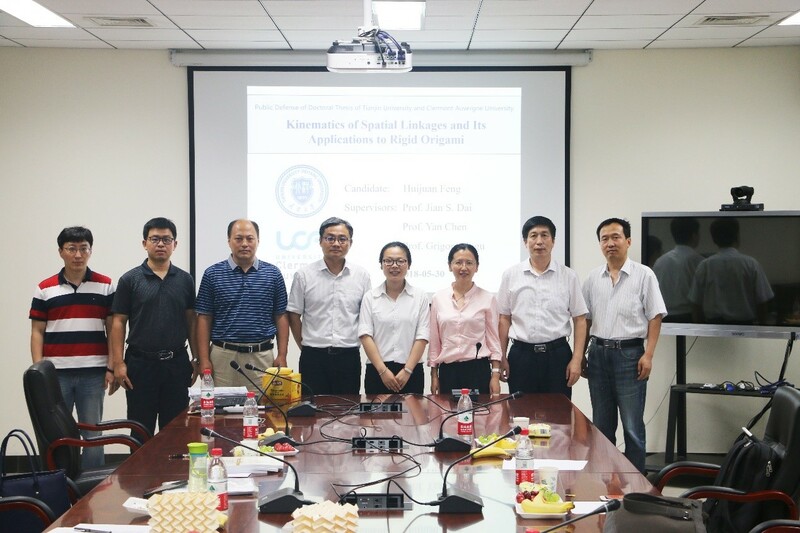 Huijuan Feng has been engaged in the study on the crossing discipline between theory of mechanism and origami science in Motion Structure Laboratory since September 2013. She established the kinematics models of numerous typical spatial overconstrained linkages, and analyzed their bifurcation behaviours together with the corresponding geometric conditions. Furthermore, she investigated the kinematics of spatial linkage network combining with the compatible conditions. Based on the kinematic equivalence between rigid origami and spatial mechanisms, she explored the rigid foldability and motion behaviours of various origami patterns ranging from 2D tessellations to closed cylindrical ones. She revealed the effect of mountain-valley crease assignment on the rigid foldability and discovered novel spatial overconstrained linkages from networks of spherical linkages by using the kirigami technique. In addition, she extended the analysis method of rigid origami based on spatial linkage kinematics from zero-thickness to thick-panel origami forms. With these achievements, she has published five journal papers (four as the first student author, and another two are ready to submit) and one conference paper. In 2016, she was awarded a scholarship under the State Scholarship Fund to pursue her study in France as a joint PhD student, which provided her the chance to join the dual-degree PhD project between University of Clermont Auvergne and Tianjin University. She will work as a postdoc in Reconfigurable Robotics Lab at École Polytechnique Fédérale de Lausanne (EFPL) from September 2018.